There are a lot of iOS users who have this confusion when it comes to transfer photos from iPhone to PC. We all know that every iPhone comes with high end technology specs and it goes same for the camera also. If you have an iPhone, you will definitely take a lot of pictures all the time to capture your precious memories. But storage is another thing you need to keep in mind. To free up space, you will definitely need to put your photos in a PC so that you don't have to worry about any storage limitation problem. Also you can use your PC storage for keeping your photos as backup. This article will give you various effective solutions for how to put photos from iPhone to PC. If you want to put pictures from iPhone to PC effortlessly, then you need to seriously consider using Tenorshare iCareFone.It's really easy to use, user-friendly and it will allow you to selectively transfer photos you need from camera roll, photo library or other albums. This tool is compatible with Windows/Mac and all iOS versions. Besides, all photos transferred by Tenorshare iCareFone can be directly accessed and will remain the original quality. Learn how to export photos from your iPhone X/8/8 Plus/7/7 Plus/6/6s/SE/5 by following below steps. 1. At first, download this software in your PC and then install it by following proper installation steps. Now run the software in order to proceed to the next step. 2. Use the original or a good quality USB cable to connect your iPhone to your PC. Never use a low quality USB cable for this process. 3. Now go to the main interface and choose "File Manager" option and then select "Photos". 4. You will see all your photos on the display on the computer screen. 5. You can either choose any image you want to put on your PC or you can just click on "Export". 6. Within a very short time, all your photos will be transferred to your PC. You can use them anytime or you can keep them as backup. Are you facing problem in importing photos from iPhone to Windows 10/8/7 PC? If you are reading this article then you can stay assured that your problem can be solved easily. The best way to import photos from your iPhone to a Windows 10/8 PC is via using the Photos App and if you have a Windows 7 PC then you can use the Autoplay feature. All you need extra is a good quality USB cable to complete the job. One thing you need to keep in mind is that, you must have iTunes installed on your PC so that this whole process works smoothly. 1. Check if the latest version of iTunes is installed in your PC or not. 2. Connect your iPhone to your PC using that USB cable. 3. Open your iPhones camera which will automatically prompt the Autoplay box to pop up in the PC screen. 4. Select the "Import pictures and videos" option and then select any picture you want to transfer. 5. Now click on "import" to complete the process. 3. Now, run the Photos App on your PC. 4. Then, you will find a small "Import" option on the top right corner of the interface of this app. Click on that option and choose your iPhone as the importing device. 5. Select all the photos you want to copy from your iPhone and click on "import" to finish the process. 1. If you want to transfer a small amount of photos to your PC then you can use this process easily. 2. First you need to open the Photos app on your iPhone and choose the images you want to transfer. 3. Now choose the share option and tap on the "Mail" option from the list. 4. Now just fill in your email address on the address bar and send the mail. 5. Now open the email from your PC and download the images from your email. You can easily transfer all of your photos from iPhone to PC via cloud storage platforms, such as Dropbox. 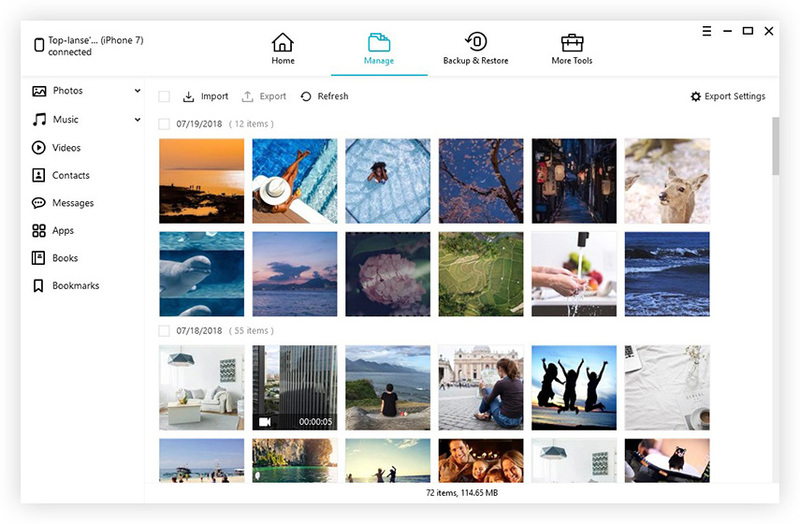 Dropbox is one of the best cloud storages to store all of your photos. 1. First, Install Dropbox into your iPhone and PC. 2. Now open the Dropbox app in your iPhone and go to "Settings" tab. 3. Enable "Camera Uploads" option and now when your iPhone is connected to Wi-Fi, all photos will be automatically uploaded to Dropbox. 4. Open Dropbox program on your PC or go to Dropox.com. 5. Locate your desired photos and download them to your hard drive. Here is how you can get photos from iPhone to PC by using Google Drive. 1. Install the Google Drive app on your iPhone and PC. 2. Log in to your Google Drive by using your Gmail account from your iPhone and PC. 3. Find the photos you want to transfer to your PC and select as many as you like. 4. Select the "Share" button from your iPhone screen and then select Google Drive to upload the photos in your drive storage. 5. After the upload is complete, download the photos from your Google Drive in your PC. This article gives you the best 5 ways in putting pictures from iPhone to PC in a very short time. You can choose any of these methods to go along with but the best option is Tenorshare iCareFone. This awesome tool will help you transfer all your photos from your iPhone to PC in the easiest way. Your photos will stay undamaged and the quality will be same as the original. Just go for this software and you will never regret again.